Free Estimates & Licensed Technicians! There is nothing worse than a plumbing emergency, especially when it involves having to turn off your hot water heater. Whether the problem is caused by a leak in the system that causes flooding, or by an accumulation of water in your basement that threatens the integrity of your hot water heater, you can be caught unaware pretty quickly. In either situation, you will need to know how to turn off your hot water heater before it gets further damaged or causes more problems. Thankfully the process of shutting it down only consists of a few fairly simple steps. Turn the gas off. You need to do this before you tackle the remaining steps, otherwise you risk damaging the hot water heater further, as well as potentially causing an explosion if the gas kicks in and has nothing to heat. Look for the valve labeled “GAS” and turn it firmly into the “OFF” position. If your hot water heater is electric (it will have an AC power cable at the top instead of a gas valve), all that you need to do is set the power switch to the “OFF” position. 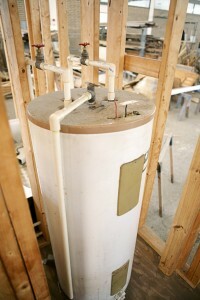 Disconnect the hot water heater from its water supply. Look for the cold water supply valve (like the gas valve, this should be clearly labeled) and turn it into the off position. If you cannot find the valve and are in a hurry, turn off the water supply to your house from the water main. This has the unfortunately side effect of turning off all of the water to your house, but it will also cut off the water to your hot water heater. Drain the remaining water from the heater. This is especially important if the heater itself is leaking. Connect a garden hose to the drain valve located at the bottom of the hot water heater. Place the other end of the hose outside, away from plants if possible, as the hot water will damage them as it drains. Turn on the hot water on a faucet anywhere in your house to kick start the draining process, then turn the faucet off and let the water drain out. Infinite is Ready to Help!